ROI Blueprints provides cloud-based project management software services to help businesses select the right projects by capturing ideas, turning those ideas into projects, and then managing the delivery of those projects to ensure return on investments. Work for ROI Blueprints, data-driven Project Management software? 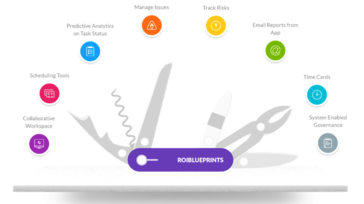 "ROIBlueprints - Everything you need"
ROIBlueprints is a great tool that includes everything you need for the full lifecycle of project and portfolio management. Starting from the initiation phase of project budgeting and approvals to the finalization and everything in between. SaaS model makes it very easy for external company resources to engage in the project process. For PMs making the transition from a Microsoft Project environment, the tool can seem limiting in comparison, but after sometime becoming familiar with the tool, those PMs find it easier to us for overall management. Executive awareness was one of the most critical items. With the ease of accessing all projects and the overall Health Score rating the ROIBluePrints provides, the Executive team can quickly gauge project status and progress. The integrated time tracking has also made account for Capex money by our Finance team. "Powerful Project Management System filling gaps where others come up short." The software is focused on the fundamentals of project management without trying to be everything to everyone. It does an excellent job of addressing the key areas of managing people, work and risk to support the efficient execution of projects that matter. It fills gaps left by other project management systems by excellent support for financial analysis of projects and making it easy for executives to understand the health of projects being executed as well as for project managers to understand the intricacies of how their project execution is going. One of the most powerful features is the plain text explanation pop-ups on every task that explains how it is going, beyond valuable to every PM! With enhancements being added regularly there is little to dislike, there is only what is still yet to come. Advancements (increased complexity)in their existing role and permissions model along with an API to connect to powerful BI and visualization tools would be a welcome addition. Increased robustness in their project invoice management functionality, advanced Resource Demand/Capacity analysis and their interface for managing task and cross-project dependencies are coming and will make the tool even better than it is. The software supports consistent cost/benefit analysis across projects focused on standard measures such as NPV, IRR and Payback allowing strategic decisions to be made throughout the project lifecycle to ensure a healthy portfolio of delivery for your customers. The financials portion of the software can be confusing, but I am also not a financial expert and do not use it much. I find that the more I use this area, the more familiar I become and the easier it is. It, like the other areas is great for tracking numbers and keeping everything in one place. And... allows for easy updates and reporting. Give it a chance! For those Project Managers who come from the world of MicroSoft Project, this change will seem very foreign and even cumbersome at first. Once you learn the software, you will realize how easy it is to use and how much more data it is capable of providing for your organization. We use it as our only Project Management tool here at CEC Entertainment. I left Greyhound in January, 2018 and came here then. I used the project at Greyhound and then again here at CEC. It makes task management and time tracking for the resources on my projects so much easier. Everything is easily seen and easy to update. The executive dash board is very slick ! For any company that is looking to deploy a new project management tool, give ROI BluePrints a try. Having used MS Project, Enterprise edition, Plan View, WorkFront, and more, ROI was easy to learn and for those new to project management, it should be easy to learn as well. Easier to use that either MS Enterprise Project and more robust than other tools on the market. Having a consolidated view of the project, tasks, risks, milestones, resources, budgets is always a challenge. The executive dashboard associated with ROI BluePrints provides the user and stakeholders with the information in a manner that is easy to consume and understand. "ROI Blueprints great PM Tool!" ability of capture all needed info, build biz cases online, detailed financials. Information is presented clearly, with great exportable reports to use without re-entry/ re-formatting. they've thought of everything. Plus, the info is elegantly presented. unfortunately, we are still use other timekeeping and reporting systems; working to get everyone into one system. this is our implementation issue, not a tool issue. While basic users and project members can easily get up to speed, there's a bit of a learning curve for PMs. Great support during implementation. Support always available. We have used the tool for IT projects, to track accounting processes like month-end, and we've started using to manage out client on-boarding work. We also use in our international orgs. "Implementation Project Management - Finally a system that has it all!" Everything! The dashboard and analytical capabilities are dynamic and value added. The project management - timeline tools are robust and have everything I was looking for, in one system. The ability for advanced task management using date dependencies and email technology to send task reminders to the individuals assigned, a bonus. In addition the support available to assist with training and troubleshooting has been top notch. Can't think of anything. Questions addressed immediately and support staff on the ready to help. Custom, detailed, date and task driven project management. It has everything i need in one tool. Have been searching for a solution for some time. Other systems had some of what i was looking for but not everything. ROI Blueprints has everything, plus. "Your one stop project management shop"
The dashboard views of project health, financials, and specific direction to where issues are. The initial learning curve can be high, but once you understand the layout and learn where the levers are, the product really comes alive! "Working w/ROI has been a great experience - from their customer service to overall program function." The ability to customize the program per user vs having to work within the box. Not many negatives here, but one thing I would like to see changed is for the manage projects view to auto-fit vs. having to scroll if numerous columns are used. Or if that is not possible, having the ability to freeze columns in that view, similar to the top row which is fixed. Single source for critical project information (as it relates to project manager reporting) and project scheduling which is next on our deliverable list....looking froward to implementing cross-departmental scheduling. The resource management or process workflow can be improved. But overall no complains. Learning about ROI Blueprints, data-driven Project Management software? * We monitor all ROI Blueprints, data-driven Project Management software reviews to prevent fraudulent reviews and keep review quality high. We do not post reviews by company employees or direct competitors. Validated reviews require the user to submit a screenshot of the product containing their user ID, in order to verify a user is an actual user of the product. Hi there! Are you looking to implement a solution like ROI Blueprints?